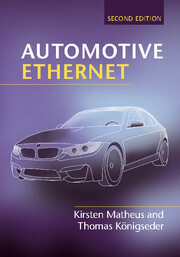 Industry pioneers share the technical and non-technical decisions that have led to the success of automotive Ethernet, covering everything from electromagnetic requirements and physical layer technologies, Quality of Service, the use of VLANs, IP and Service Discovery, and network architecture and testing. This is a guide for engineers, technical managers and researchers designing components for in-car electronics, and those interested in the strategy of introducing a new technology. Kirsten Matheus is a communications engineer who is currently responsible for establishing Ethernet-based communication at BMW and within the automotive industry. She has previously worked for Volkswagen, NXP and Ericsson. Thomas Königseder, BMW Munich Thomas Königseder is a communications engineer who manages the team for electromagnetic compatibility at BMW. In 2008, he was responsible for launching the first car with an Ethernet connection.